In recent years, we may have witnessed service animals assisting humans more than ever before. Traditionally, we may be accustomed to observing someone who is blind or has a visibly noticeable challenge utilize the service of an animal, usually a dog. Today, though, animals are assisting with less visible concerns, including mental health conditions and challenges including autism, posttraumatic stress, anxiety, and panic, among others. Typically, a psychiatric service dog provides assistance by helping a person of any age with needs that could not be met by other means. Service dogs can also disrupt problematic or self-harming behaviors or challenges, allowing a person to engage in daily activities as fully and successfully as possible. For example, someone with PTSD might experiences hypervigilance and be afraid of being vulnerable in public or entering their home after being away. 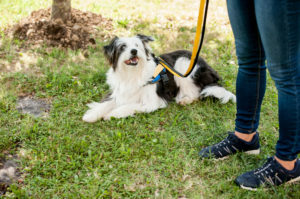 A psychiatric service dog can not only provide additional protection but also help the person regain a sense of calm by looking out for and alerting them to potential risks in public and screening for threats before they re-enter their home. A child with autism might have a service dog who helps disrupt self-injurious behavior or provides a calming effect during heightened emotional states. In this way, the presence of a service dog can facilitate a person’s ability to move freely, with increased ease and less fear, as they go about their daily activities. As animals appear in places we are not used to seeing them in, new concerns may be raised, particularly for those who depend on the assistance of a service animal. As a psychologist who works with people who have service animals, I would like to address how the rest of us might be most helpful and supportive of those who have service animals. When the general public does not know how to act or respond to a service animal, this can put both the animal and the human who depends upon its service in danger. Below is a quick and easy guide for what you need to know about service animals and how you can best support someone who has a service animal. Service animals are specially trained to help the person they serve. When out in public, service animals are “on duty.” Distracting service animals in any way (calling them, making sounds to get their attention, or trying to pet them, etc.) may keep them from completing their job, which could be life-threatening for the person who needs their help. Not all disabilities are visible. Many people are accustomed to seeing service dogs accompany people who have visible physical disabilities, such as blindness. However, keep in mind that many animals are trained to help people with conditions that are not obvious to others. It might seem harmless to address a service dog if the person they are assisting seems physically able-bodied, but not only is it never a good idea to make assumptions about a person’s ability, distracting the service animal could be equally as damaging as distracting a seeing-eye dog. It is not appropriate to ask why someone has a service animal. It may not be apparent to us why a person has a service animal, but we are not entitled to ask for such a disclosure. Asking such a question is akin to asking a person about their medical history. How would you feel if a stranger on the street asked about your medical history? Beyond this, it may be traumatizing for some to talk about why they have a service dog. Imagine a person who needs a service dog to help them with PTSD symptoms and consider that asking them why they have a service dog is, in a way, asking them about their trauma. Recounting past traumatic experiences may lead to further trauma. While they may be furry and cuddly like pets, a service animal on duty is essentially equivalent to medical equipment and should be responded to accordingly. The best thing to do is ignore the animal. The service animal is there to serve a person; it is not there for entertainment or play. Do not call, make sounds to attract (whistling, kissing sounds, etc. ), approach, or pet the service animal. Do not let your dog or animal approach the service animal. Do not ask the person why they have a service animal. If you have children, teach them these guiding principles. Make sure children know not to run up to a service animal or pet it. If you see your friends try to interact with a service animal, let them know why it isn’t a good idea. If you are afraid of or allergic to the service animal, simply keep a reasonable space between you and the service animal. Service animals are trained to not interact with others unless they consider them a threat to the person they are serving. Avoiding loud or emotional responses around a service animal is likely to be enough of a buffer to minimize or eliminate any contact you might have with the service animal. It is my hope that this brief overview can help provide education about service animals so the people who depend on their assistance are able to go out in public with less apprehension and anxiety. If you happen to find yourself in a situation where you are uncertain what to do around a service animal, simply ask the person with the animal about their needs or preferences without asking for details about their need for a service animal. Respectful communication and greater awareness are generally helpful for all involved, regardless of the circumstances.